FUTURES Foundation for Volusia County Schools has received a $12,000 Hurricane Irma Relief Grant from the United Way of Volusia-Flagler Counties. In writing the grant, FUTURES worked closely with the Volusia County School District’s Facilities Services, Grants and Technology Departments to identify technology equipment damaged by Hurricane Irma. The grant’s funding is from the Lilly Foundation and other corporate partners designed to provide relief and recovery after Hurricane Irma. In total, the United Way of Volusia-Flagler Counties has distributed over $200,000 in grants for relief and recovery efforts. 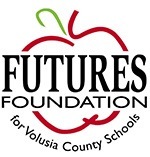 FUTURES Foundation is a nonprofit, direct support organization founded in 1985 to support Volusia County Schools. Its mission is to engage business and civic leaders to promote and achieve educational excellence for Volusia County Public Schools. The Foundation’s 32-member board of directors consists of area business and civic leaders who direct and raise funds to facilitate a variety of programs in the school district. 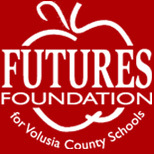 For more information about FUTURES Foundation, please contact Executive Director Cynthia Ramirez at (386) 255-6475, ext. 50730, caperric@volusia.K12.FL.US or visit its website at www.FuturesVolusia.org. Photo: Pictured left to right are Volusia County School Board Chairman Linda Cuthbert, Volusia County Schools Chief Academic Officer Teresa Marcks, FUTURES President Paula Gregory and FUTURES President-Elect Susan Mendez.